Home / Blog / What is the Best Wax Warmer? We have been getting a ton of questions about our beautiful wax warmers! With so many wax warmers being sold in stores and online, it can be difficult to know when you are getting a quality product. HK Wax Center – Austin Arbor was determined to find the best wax warmer out there! Size is going to be one of the biggest factors you need to decide when looking for the perfect wax pot. Since we do a high volume of waxes per day, we knew we would need a very large wax warmer. However, if you aren’t going through a bunch of wax, then a smaller wax pot might be better for you. Another factor to keep in mind would be the type of wax you use: hard wax or soft wax. A lot of wax pots have two warmers built in one. This is great for companies who use both hard wax and soft wax. If you only use one type of wax, then a single pot would do just fine. We found Rite Hete while doing a search online and immediately knew they were the best. They used to make the wax warmers for European Wax Center which says a lot! 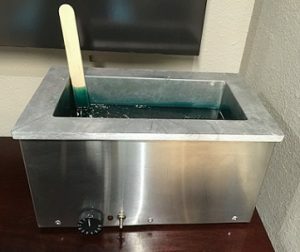 The exact one we use in our wax rooms are the Type V-1.5 Gallon 12x6x5 Deep Rectangular Melting Pot Salon. Take it from us, that pot is a hustler! It warms the wax beads perfectly and stays consistent all day long. Plus, it’s HUGE!! All we need to do is fill it up one time and we are set for the rest of the day. Also we must mention, the owner at Rite Hete, Steve, is always wonderful when ordering and willing to answer any questions we have. We have been using this pot for years and I can’t see us ever switching to another warmer. LOVE your videos and blog! If you were going to do waxing services in a client’s home, what warmer and mobile table would you recommend? Thanks!